The SBG150 is a gas (petrol)-powered portable rail grinder from ERICO® designed for use with rail steel. The SBG150 allows grinding in tight areas and grinds the head and web with the same piece of equipment. This powerful, lightweight unit has a 39 cc two-cycle engine that is 10% larger than previous models, yet it weighs only 18 lbs (8.2 kg). Designed with operators’ needs in mind, the grinder features an adjustable tool rest that allows the operator to “rest” or support the grinder on top of the rail during use. This helps to eliminate fatigue, and the tool rest can be easily adjusted for proper positioning of the grinding wheel. The maximum wheel speed is 6,000 rpm, and the power head handle incorporates a base plate to protect the engine from damage. The handle design provides proper balance while in operation, and includes anti-vibration padding to reduce operator fatigue while grinding. 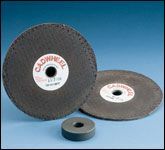 ERICO’s unique organic cleaning wheels effectively prepare the rail surface for applying CADWELD® exothermic welded bonds. These innovative wheels are self-cleaning and leave no resin on the bonding surface. To reduce the possibility of damage and wear from long-term use, the SBG150 offers a stronger shaft and reduces vibration with increased grinding wheel stability. To make grinding projects less problematic, identical spacers help eliminate guesswork when determining proper spacer placement and a smaller adjustable grinding wheel guard rotates 360º to allow for grinding in tight areas. A redesigned toolbox is also available to help with storage and easy transport. For grinding in tight areas and grinding the head and web with the same piece of equipment. SBG150 grinds the head and web with only one piece of equipment. 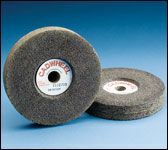 Two sizes of grinding wheels are available; all wheels are designed by ERICO® to properly clean the rail surface. All wheels are self-cleaning and organically bonded, leaving no residue to contaminate the bonding surface. 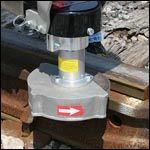 Slotting disks are also available to fit the grinder for trimming rail ends at insulated joints, the removal of bonds and preparing lipped rails. 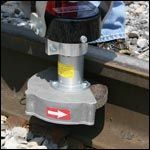 The slotting disks are not recommended to be used for cleaning of rail. CADWELD® exothermically welded connections bond electrical conductors to the rail without altering the in-service performance characteristics of the rail.